Mercedes Benz had been very curious to cash in on the G63 AMG but this craze would have gone so far that we hadn’t dreamt of. As per our reports of Mercedes Benz G63 AMG got loaded with additional two tires (i.e. 6×6) heading towards Dubai; now it got confirmed for production. Naming only a few of them, Mercedes Benz is happy to roll out only 20-30 units every year as it lacks good number of buyers in present. But no to disappointment, Mercedes stands strongly for the future growth which it thinks would rise when the grudging power of 536 HP and 560 lb-ft of torque from 5.5-liter V8 will be delivered on all “6”. To be more clear on its off-roading part, five differential lock is lugged underneath 6×6 which will never let it to get stuck somewhere that is not meant to be for this powerful machine. One must be thinking about its fuel consumption so let us tell you that an efficiency of 13mpg will be burnt out from the engine bay. 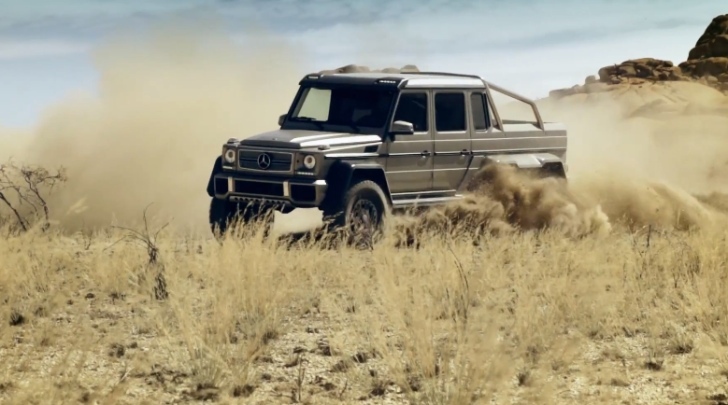 While top speed too must be on the doubt list, but running over the expectations, maximum flickering of 160 kmph shines brightly under Mercedes Benz G63 AMG moniker. Information bit: The special version of G320 CDI under 6×6 traction was used by Australian military which was then followed by other armed forces around the world, before falling into the hands of civilians. G63 AMG 6×6 price is so pricking that only ultimate-riches will be able to draw the amount like the recent one namely Dubai’s Royal Family; being calculated more than three times by that of outgoing 63 AMG. No matter if one can’t buy that mean intruder, we have tagged the video below which will definitely fulfill all the thirst of adventure sports.